Interested in an alternative to a POWERMAT? Energizer will be taking a jab at the wireless charging market by introducing their first inductive charger built with Qi technology, the new universal charging standard developed by the Wireless Power Consortium (WPC). The Energizer inductive charger will be able to charge up to 3 devices with a USB port available for a 4th device. Current projections for wireless chargers claim it will grow from 3.6 million units in 2010, to 234.9 million units in 2014. 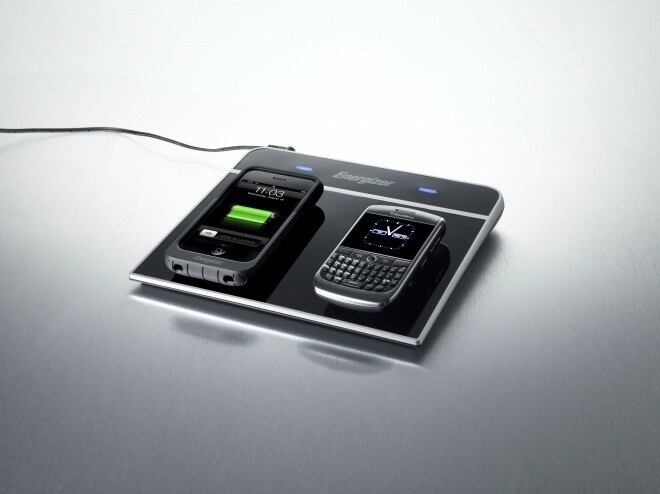 The Energizer Inductive Charger will be introduced with a one-time replacement Qi Door for the BlackBerry Curve 8900.The Energizer Inductive Charger will be available at retail this October. Suggested retail price is $89. The removable Qi door for the BlackBerry Curve 8900 will be sold separately for $34.99 each. For more information, visit www.energizer.com/inductive.